It started in early February 2014 when a friend spoke about Tim Noakes new diet Red Book. After browsing through her copy, I decided to buy my own copy of the RMR and started reading. There was a lot of information to absorb and the recipes looked very gourmet. It took a while for me to adapt my own style of cooking but strictly following the ingredients from the Green list. In order to better understand the process of nutrition and Insulin resistance, I visited a local health shop and was introduced to a lovely lady, Tanya, who is also a pharmacist. She did an assessment, weighing and measured me and also explained the process of different food absorption. She also assisted me with some meal plans and made copies of the lists in order to assist other people seeking her help. My heaviest recorded weight was 93 kg and although the initial weight loss was slow, it was steady with a few ups and downs. I now know why I might have had an increase from time to time my sensitivity to anything sweet had an effect on ability to burn fat. This has taken more than a year to click and fully understand. With the increase in social media, Banting became much more popular and when Loose It magazine was first published it opened a whole new world for us all. During those first 5 months I used a 20 year old Carbohydrate, Fat and Calorie counter that I had bought when I tried the Atkinson diet, pity that it didn’t take off for long enough in this part of the world; just imagine how many people would have been so much more healthier! Armed with a new edition of the Carbohydrate, Fat and Calorie counter, I continued to lose weight. I feel that this publication is a vital guide to all it lists all the South African foods, both fresh and processed. It is a quick guide to how much fat and carbohydrates the food contains. By the beginning of May 2014 I had lost 12 kgs and by mid October I had reached the 20 kg loss mark. At this point I need to mention Brian Berkman, whose story was published in the first edition of Loose It magazine. I found his email on line and started mailing him. He has been the most inspiring person during my journey and I had the great pleasure of meeting him at the LCHF Summit in February this year. My emails to him were promptly answered with those little- known titbits and his blog became a wonderful source of information and further inspiration. My health improved to such an extent that I no longer suffered from heartburn, indigestion, nausea, bloating, constipation and most of all debilitating arthritis. The arthritis had been a big issue as I was on anti-inflammatories and I had suffered from hair loss. I stopped taking the medication as soon as I started feeling better but still take glucosamine as a joint supplement. Other medications include a multivitamin, Omega 3 and folic acid. According to my GP I have genetic high blood pressure and take medication to keep this under control. But the other good news is that I now have a BMI of 23.6 and my total cholesterol is 3.3mmol/l. The random glucose is 4.4mmol/l. I still need to have my HbA1c tested next month to compare with last year’s test it was a bit high at the time. During 2014 I was unable to do any exercise due to a prolapsed cervix that placed pressure on my bladder and I had to spend most of the time sitting. So the myth that one needs to exercise in order to lose weight definitely did not apply in my instance. In early November 2014 I had a hysterectomy and after coping with an infection, I recovered with even more energy and the desire to get moving. I joined a gym in order to strengthen my muscles and upper body. This was in preparation for starting golf lessons! My weight had dropped a further 4 kgs and goal weight was in sight. The last 1.5 kgs finally came off once I stopped using xylitol. I realised that this had caused my few gains when I started Banting and even Brian Berkman had mentioned that even the thought of something sweet can interfere with your insulin resistance. By the way, I work in an office across the road from Knysna’s famous Ile de Pain coffee shop. They bake wonderful breads and croissants and the smell that wafts into our premises definitely triggers my hunger! From time to time I would be very hungry between meals I thought that was due to not eating enough fats. When I mentioned this to Dr Eric Westman at the LCHF Summit, he said that I was eating too many carbs. As we all know, everyone reacts differently to the Banting way of eating. I changed my snacking style of eating and concentrated on eating a large high fat first meal of the day. This definitely helped with the hunger and I am coping most days with only eating twice a day. I find on the weekends that I tend to want to nibble, so I try and keep busy with gardening and walking. Recently I had to visit my GP for an old hip problem. She was so impressed by my weight loss that she provided some of her patients with my contact number. I am only too happy to share my experience and assist with morale support. Unfortunately my husband has been sceptical about the whole Banting scenario. As he does not have weight or health issues, I do not have his full support and still do some baking for him. Fortunately, I found that somehow I have never been tempted to indulge in non Banting foods; my silent motto has been you always have a better choice- the choice of Banting foods is so vast and delicious. I have learnt to make real chicken fat that I use as lard and have no need to use much coconut oil. All loaf type recipes I make in a silicone muffin pan and freeze for a quick addition to my food that I take to work. All nuts and seeds are roasted and frozen for delicious additions to muffins and salads. My greatest highlight was to attend the LCHF Summit in February this year. I attended the Public day and had the pleasure of meeting Prof Tim Noakes and Dr Eric Westman. The other speakers were incredible with their presentations. I requested and received the program in PDF and have forwarded it to my contacts who are interested in Banting. There are wonderful Nuggets extracts from the Summit on various FaceBook sites. There is so much information and help with online courses, meal plans and recipes. Besides the 24 kg I have lost, I have dropped 2 dress sizes and even my shoes are too loose now. 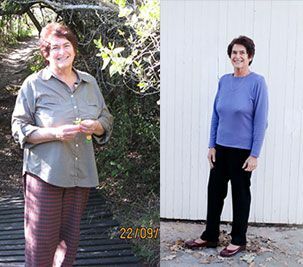 Banting is now a way of life it was so easy to lose the weight. I feel incredibly healthy and liberated.